The last week saw two announcements from storage suppliers that will challenge the need for standalone storage at the lower small- and medium-sized enterprise (SME) end of the market. The first came from Nutanix, a startup that offers hyper-converged systems, merging compute and storage and removing the need for a dedicated SAN. The company said it had raised $101m from venture capital investors, valuing the company at around $1bn. Nutanix is not the only player in this part of the market. There is also SimpliVity, another startup and other so-called hyper-converged systems are also available from Scale Computing and Pivot3. The move to hyper-converged appliances is not a hardware-only play, with software-only startup offerings from Maxta, and ScaleIO from EMC. VMware is looking to get a piece of the action with VSAN, although that system is locked into the kernel of vSphere and unlikely to ever support heterogeneous environments. The issue for storage suppliers that sell products at the low to mid market is that, as virtualisation increases its reach in the datacentre, systems can be deployed without SAN storage altogether. The savings for the customer are clear – reduced costs for hardware and maintenance and the ability to cut staffing costs in dispensing with dedicated storage teams. Meanwhile, another announcement from last week, this time from IBM, shows the threat to existing storage paradigms from the server side. How does the cost of a hyper-converged system compare to SAN or NAS? Big Blue has refreshed its xSeries server platform (pictured) and the new systems include a feature called eXFlash. This is server-based DIMM-slot storage that does not lose its content when the server is switched off. The benefit of eXFlash (as well as, for example, Smart/Diablo’s memory channel storage) is in the extremely low latency it can bring. I/O response times are measured in microseconds rather than milliseconds, promising almost an order of magnitude improvement for persistent data storage. IBM also announced a new modular design to xSeries servers. This allows them to use modules to support a range of tasks, each tailored for compute, storage or I/O workloads. This ability to build a customised server means hyper-converged systems can match customers’ growth requirements, adding more storage and/or computing as patterns of growth dictate, rather than using today’s relatively static configurations. 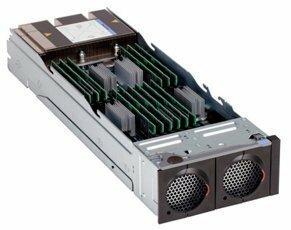 Although these initially seem like high-end options, expect other server suppliers to replicate IBM’s ideas and for costs to come down. So, where does all of this leave the storage suppliers? If hyper-converged systems prove as popular as they seem (Nutanix has already reached $100 million in sales), then the market for block (SAN) storage could shrink significantly. Meanwhile, software-only offerings from startups such as Nasuni remove the need for dedicated NAS equipment, so in a short time, storage as a separate platform could be removed from the datacentre altogether. Good article Chris, except you are mistaken about grouping in Nutanix with all of the other "hyper-converged" players that target the SME market. Nutanix targets the enterprise datacenter. In fact, 2/3 of Nutanix sales are to large enterprises or governments. As is stated in the recent Nutanix press release regarding the $101M D Series funding, "Leading enterprises including eBay, McKesson, Toyota, Orange Business Services and Hyundai Hysco, to name a few, have adopted Nutanix as their preferred infrastructure platform for running high-performance virtualized workloads." I don't know what is so new about hyper-converged storage ! In fact that is how the servers looked 25 years ago. Storage was part of the large SMP servers and then companies started specialized storage servers like file servers (NFS) and then SAN. It looks like things have come back in full circle. What is new is that you can group storage from multiple servers into one virtual volumes that can be used by different virtual machines. The IT industry really does come full circle though. It's interesting to watch. You get a new technology, individuals and departments glom onto it to avoid IT control, IT starts taking over the new technology, then some other new technology comes out.